I absolutely love brunch! Bye breakfast. I’ve decided it’s the most important meal of life. 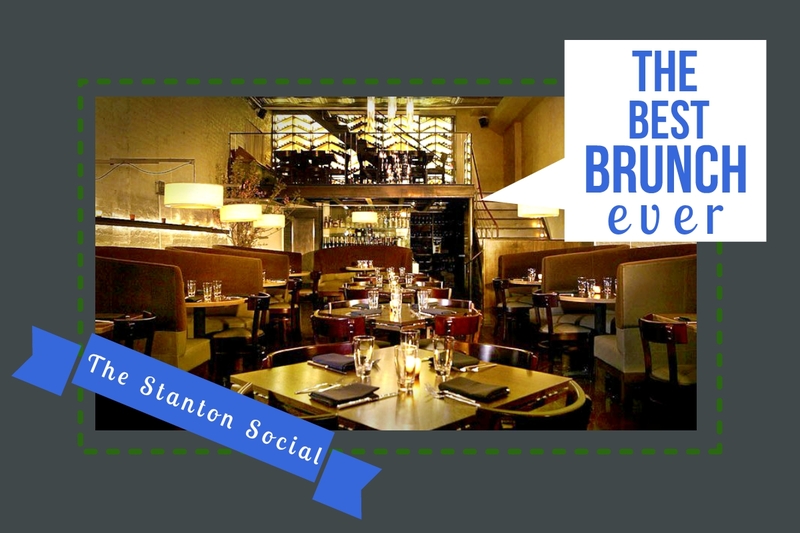 I recently had an epic brunch at what is now my favorite spot, The Stanton Social. It’s the kind of place I imagine the likes of Chuck Bass and Serena Van Der Woodsen would frequent causally. The restaurant itself is gorgeous. I felt cooler just stepping inside because that’s how trendy, yet chill, but definitely unique and swanky in a very New-York-hipster type of way the interior design is. The restaurant is three floors and “features a thirty-foot glowing wine wall displaying over 2,000 bottles of wine in a herringbone patter, fringe-covered walls, fine lizard skin banquettes, leather handrails, and belt strapped pillows, all of which subtly tip their hat to the luxury and glamour found in the textiles and fashions of the 1940’s.” So yeah, it’s real nice in there! The food is absurdly good and shareable, which is amazing. I feel like I ate the whole menu that morning because it was a non-stop parade of delicious and visually appealing mini tapas plates that continuously rolled through! Basically my foodie dream. Our first mini course was so sweetly delicious! 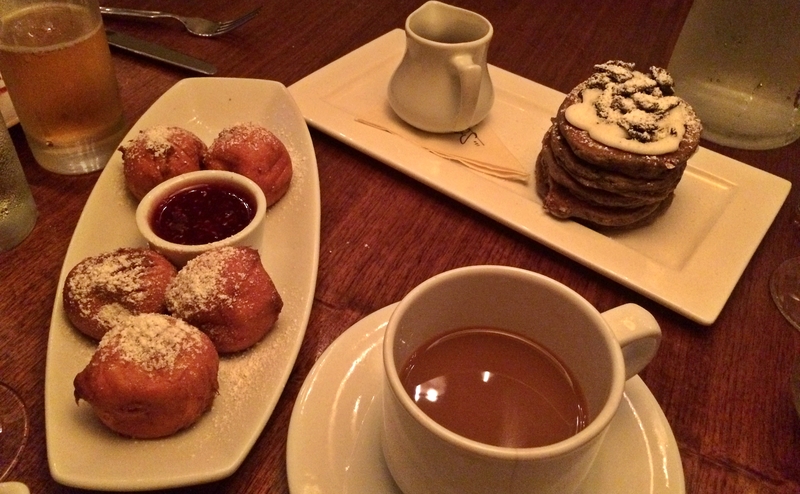 We ordered the Oreo Pancakes and Ricotta Fritters. 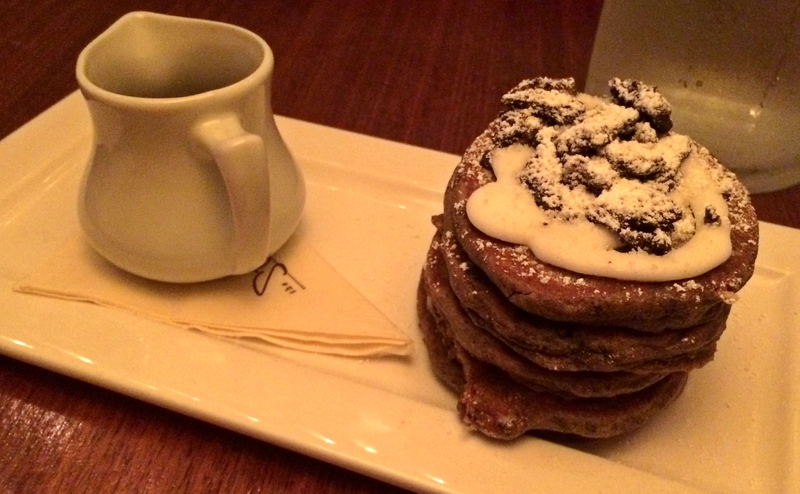 I was very excited for the Oreo Pancakes in particular for completely obvious reasons. I LOVE OREOS. The pancakes did not disappoint (I also took the first couple, hence I got all the frosting.) 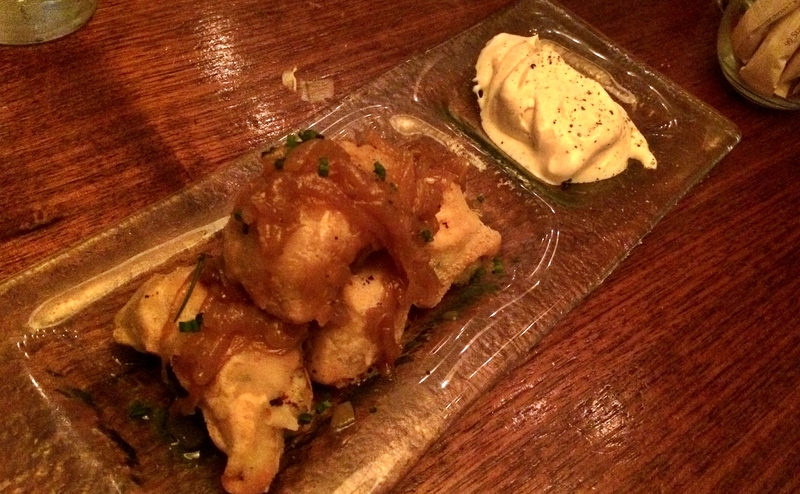 And the fritters were little bites of sweet, buttery doughnut perfection. 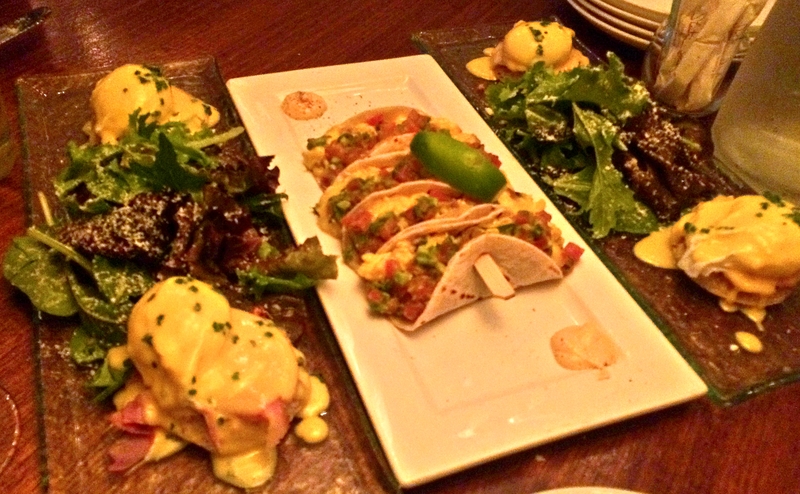 Next up: two orders of the Huevos Rancheros Soft Tacos with scrambled chorizo & eggs, black beans, salsa fresca and aged cheddar and some good ‘ol Classic Eggs Benedict. Every bite was excellent and flavorful. I love Mexican food and could have easily eaten like… 2 orders of those tacos myself! Third round: The French Onion Soup Dumplings and Potato & Goat Cheese Pierogies with caramelized onions and truffle creme fraiche! These are two of their signature dishes and both certainly lived up to the hype. These dishes were ridiculousssss! 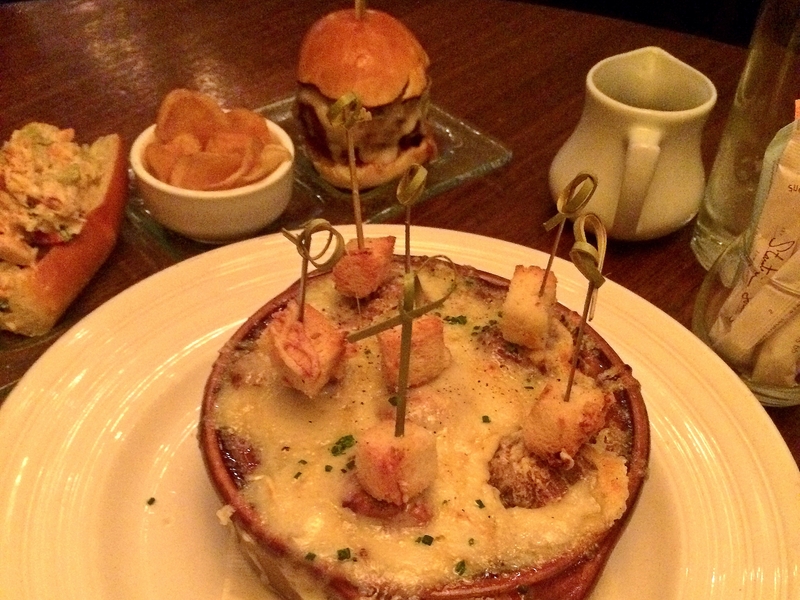 I’m a huge fan of french onion soup and so to have it in dumpling form– with a thick, gooey Gruyère cheesy top of amazingness– was fantastic. The stuffed pierogies were rich, creamy fabulous pockets of indulgence! They paired really well with the cool, intense truffle flavor of the creme fraiche. My former Polish college roommate would have died! Also worth noting, is how gorgeous their Bloody Mary cocktail is! The gorgeous, spicy drink is made with their bright red homemade bloody mary mix that, according to the waiter, gets its bold color from beets. For our final round, we got the Fried ‘Chicken n’ Waffles’ with a maple cheddar waffle and Louisiana hot sauce butter and the Old School Meatballs which were served with a basil & ricotta ‘manicotti’. 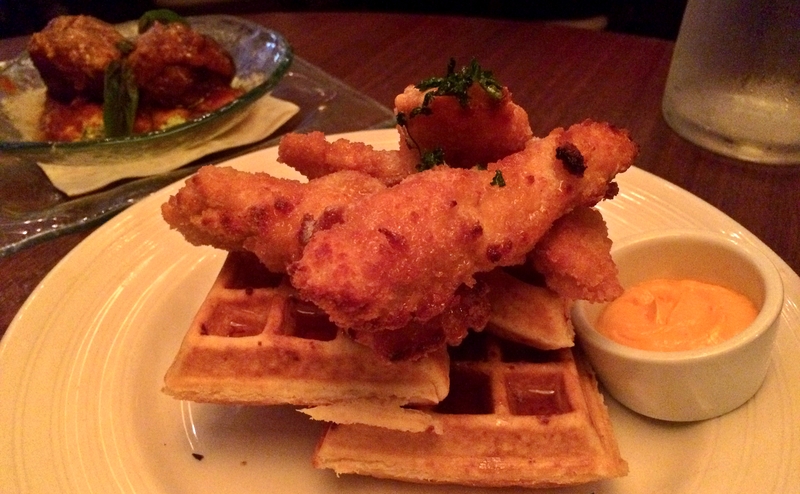 The chicken n’ waffles were solid– the chicken itself was super tender and had fabulous crunchy fried coating. And waffles are one of my favorite things ever, so naturally the bacon and cheddar waffle was all me! 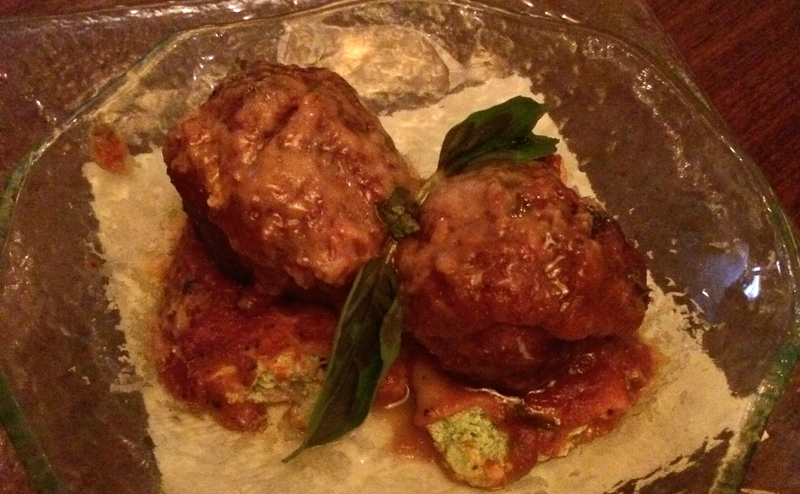 The meatballs were outstanding too. They had a really amazing, rich flavor. Too bad there were only two! How many people ate with you? That’s enough food for six people!